Heat oven to 350°F. Spray 6 (6-oz) custard cups or 6 (8-oz) ramekins with Cooking Spray. Cut each biscuit into 6 wedges. Using 5 wedges for each cup, arrange wedges around side of each cup with pointed ends up to form a “star.” Press dough lightly on bottoms and sides of cups (it is not necessary to completely cover bottoms and sides of cups). Set aside. In medium bowl, beat eggs with fork or wire whisk until blended. Beat in 1/4 cup salsa, 1/2 cup sour cream and the bacon bits until blended. 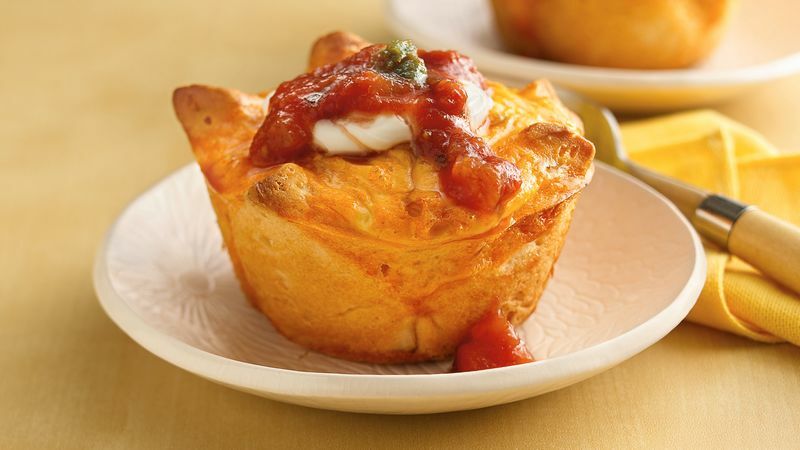 Spoon 2 tablespoons egg mixture into center of each cup; top each with about 2 tablespoons cheese. Spoon remaining egg mixture over cheese in each cup. Place cups on large cookie sheet with sides. Bake 25 to 30 minutes or until eggs are set and biscuits are golden brown. Cool 10 minutes. Garnish with salsa and sour cream.